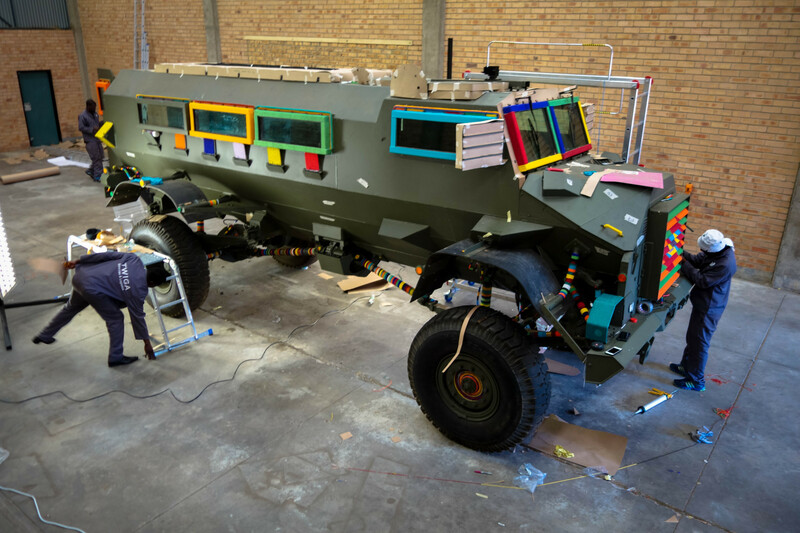 As part of the Special Projects at the fourth edition of 1-54 New York, South African artist Ralph Ziman presents the Casspir Project with SPOEK 1, a re-imagined military vehicle. Invented in the 1970s, the Casspir became a symbol of oppression and violence in South Africa and it was used extensively by the Apartheid-era South African Police against civilians. 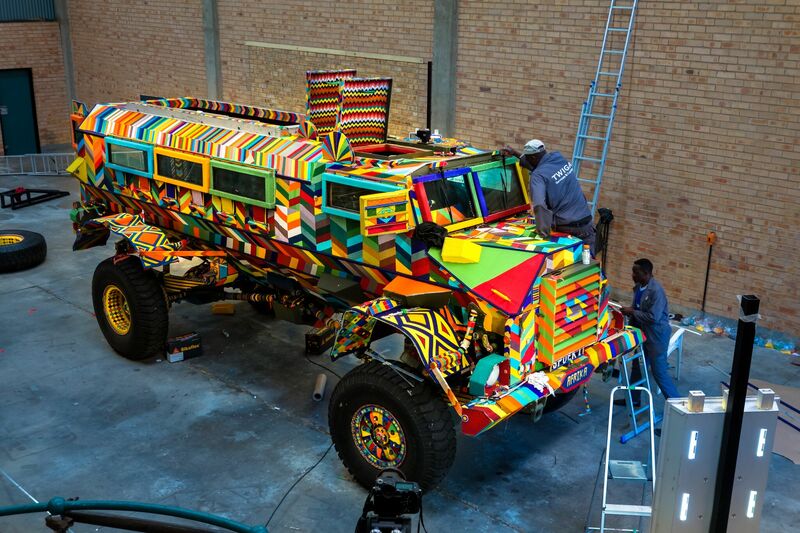 Ziman and his team, comprising almost 100 local artists and craftsman, have transformed this military tank by covering it with beads and following traditional techniques and colour palette. In interview with 1-54, the artists shares the story of this project and the aims of his work. You have a background in filmmaking and work with a variety of media. Can you share with us how your experience in film has influenced your artistic practice? Film is an all-encompassing visual medium. It combines aesthetic, storytelling, sound and music, it has to tell the story and must make sense in the big picture. Through my art, I want to tell stories that are concise and effective, I want people to see the big and the small picture. Another way that filmmaking has influenced me is that it’s a collaborative art. It’s too much for one person to do alone. I learnt to work with other people, I needed to learn how to get what I wanted creatively from my collaborators, while also learning how to take their ideas. Through The Casspir Project you have in some ways eviscerated the original violent nature of the Casspir and provided possibilities for alternate meaning-making. Why do you think it is important today to give new meaning to something like the Casspir? The Casspir is the most successful vehicle ever to come out of Africa. It is a fortress on four wheels designed for urban warfare; a vehicle designed to assert dominance and to be feared. I wanted to Africanize the Casspir, to own it. By transforming it from military vehicle to an art piece, I am telling a story of its past, present and future, showing the Casspir in a new light. We wanted to sow one bead for every South African, man, woman and child. In the end we used about 70 million beads. For better or for worse, the Casspir is part of our collective past in South Africa. It was invented in South Africa in the late 1970’s as a reaction to an arms-boycott imposed by the rest of the world, aimed at ending apartheid and white rule in South Africa. Strangely, the Casspir did not die with the passing of the government that created it: it outlived its creator and spread like a cancer. We also wanted to tell the story of the Casspir moving forward. During the second Gulf War the USA bought Casspirs to patrol the streets of Baghdad and then they were brought back to the US and loaned free of charge to local police forces. As a result, apartheid-designed Casspirs have turned up in Black Lives Matters protests across the US. How does the Casspir project dialogue with your previous bodies of work such as Ghosts and Bones, which bring to light the effects of cultures of violence and the arms trade? The original Ghosts project was a reaction to the arms trade. Images of AK 47s in Africa were everywhere I looked. The automatic weapons that fuelled Africa’s bloody conflicts were all manufactured abroad in places such as China, Russia, France, USA, and Belgium. My aim with Ghosts was to manufacture non-lethal and beautiful AK’s in Africa and export them to the rest of the world and by doing so we would create jobs in Africa. The Casspir was in many ways the opposite. Designed and conceived in Africa, its oppression was exported from Africa to the world. 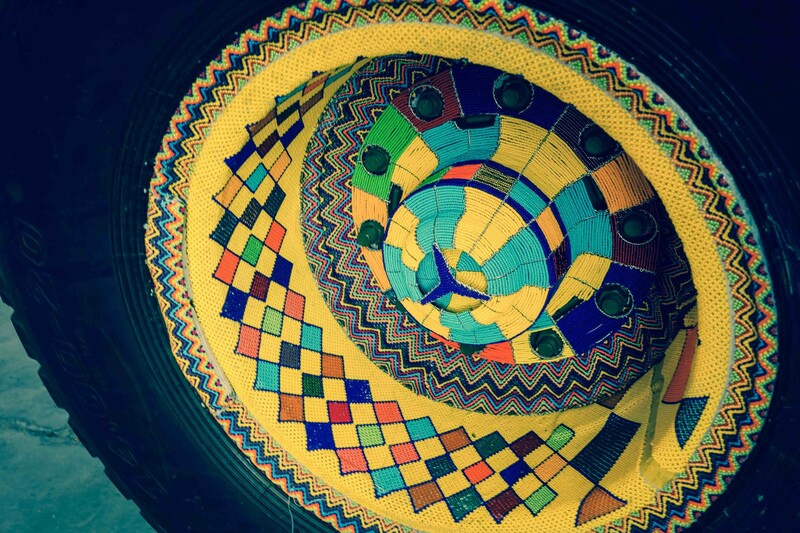 To realise this incredible project you have worked with many Southern African beaders and local artists, how did you initiate the collaborations and how did you and your collaborators find the overall experience? When I first met the Zimbabwean crew they were selling beaded animals to tourists on the streets of Johannesburg, hustling to make a living. I asked them if they could make an AK 47 out of beads and wire and that was the start of our journey together. Since then we have spent hundreds and hundreds of hours together. They have learned how to service the Casspir and how drive it. We are very much a team and we have become like family. The team grew to about a hundred people working for over a year. 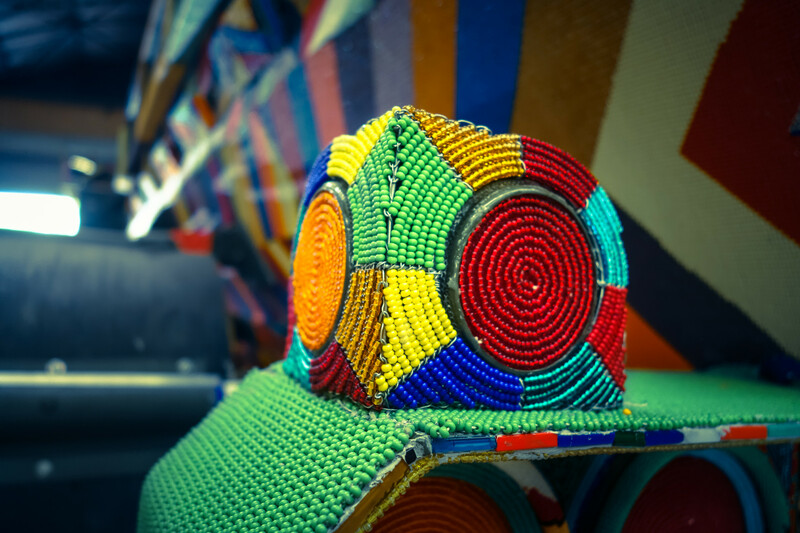 We also brought in a team of Ndebele ladies from Mpumalanga Province to weave the panels that cover the Casspir. I wanted to elevate beadwork from craft to art. In South Africa traditional crafts like beading were always looked down upon, probably because the people who made them were black, an unfortunate effect of the apartheid. Their objects were considered souvenirs for tourists or cheap toys for kids. In various cultures in Southern African and the continent as a whole, glass beads have been inscribed with meaning and are of historical and social significance. You have worked with beads on previous projects, what draws you to this medium and the kaleidoscopic colour palette? I was born and raised in South Africa. During my childhood, my nanny was an Ndebele lady. When she would return from her trips back home she would often bring us beaded artefacts that her mother and sisters had made. I remember being endlessly fascinated by these beads, the patterns, their colours. Interestingly enough, there is no bead factory on the continent. All the beads used in Africa were made in Italy or the Czech Republic, yet today most of the beads are made in China as well. The vehicle has been exhibited in South Africa and it will now be exhibited in New York for 1-54. How do you think the reception of the work differs from one continent to another? In South Africa the Casspir is already well known as the outward symbol of apartheid and oppression; it was very well received in South Africa. In America this story still needs to be told, but I hope it will be well received in America too.